Recently we here at Nachonomics learned the existence of the $2 7-Eleven tater totcho bar, which lead to a going on month and a half search for a store location carrying them. We searched high and searched low, but to no avail, our hunger for SOMETHING nachoey growing with every passing day. No one can hold out against a nacho shortage as this for long, and soon the time came when we had to say enough is enough. We were only human, and 7-Eleven’s regular nachos were close enough right? Right? The chip base was about what you’d expect from any movie theater or lesser sports arena, amounting to a plastic container with a small sealed bag of corn chips inside. You open the bag of chips, dump it in the container, boom, you’ve got your nacho foundation. From there you head to your patented liquid cheese/chili dispenser and thanks to 7-Eleven’s generous free topping policy, go to town and dump as much of that slop on as you can handle. You know this machine. You fear this machine. Rather, I would have liked to have said go to town, and had that town be a great town with a fantastic school system and low taxes, but it wasn’t. No, this was a town were the liquid cheese dispensed with a sound and volume that made it seem as though the machine was spurting out the last glop in its death throes. I did manage to get just enough to adequately cover my chips, but the trying to go for the chili was a lost cause. A rending screech as though it was grinding raw meat into the chili itself cut the air, but nothing was dispensed. Perhaps this was a blessing to my gastrointestinal system, perhaps not. I’ll never know. Next up was 7-Eleven’s globally touted 6 to 10 item topping bar meant to encourage “culinary creativity”. Low and behold, my local establishment had seven, plus one entirely empty container that must have included something at some time! It all looked very sad. Since the Sauerkraut looked like garbage and I’m not a monster, I elected for pickled jalapenos, salsa, diced tomatoes, and literally the dried-outest looking diced onions I’ve ever seen. Pico de Gallo would have been nice too, but perhaps that had been in the one empty container. 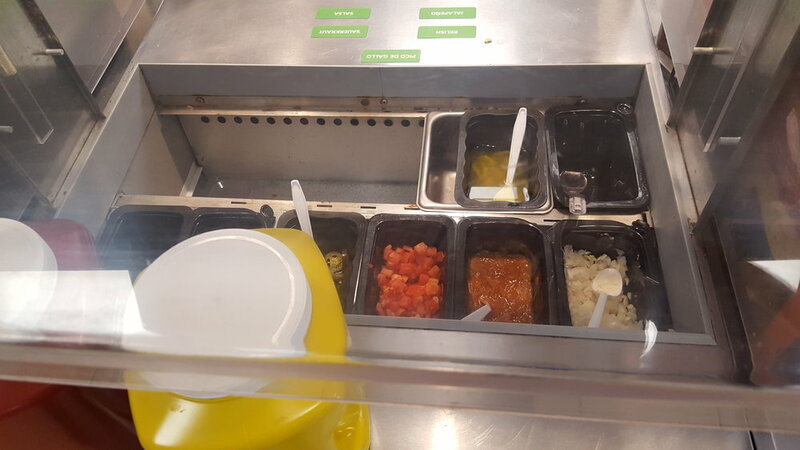 Forget the chili or chunky liquid cheese, if I was going to get food poisoning or botulism it was going to be because of these who knows how long they have been left out for toppings. They were free though, and you could use as much as you’d like, so I turned these lemons into lemonade, and then that lemonade into quite the hearty order of nachos. It was quite the surprise. 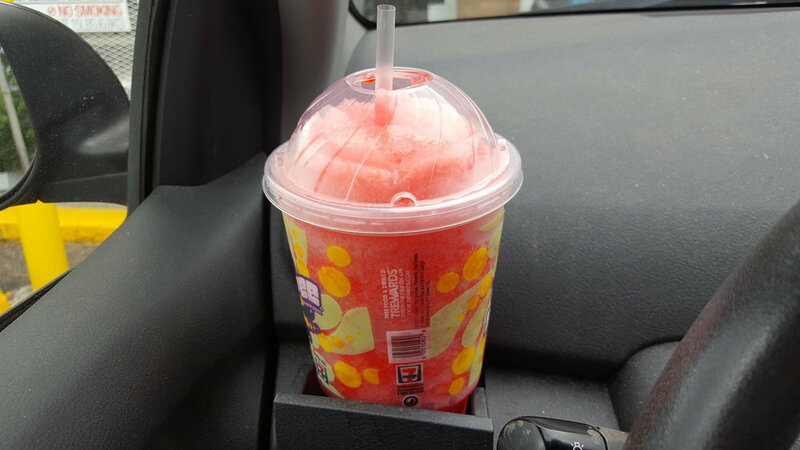 I of course had to throw a Slurpee into the mix, as what meal from 7-Eleven is complete without one, and proceeded to sit in my car and eat it all. And you know what? It wasn’t that bad. “Wasn’t that bad”, with the caveat that you exactly what you’re getting, and what that is is not high quality nachos. It is solidly in the nacho species of “Concession Nacho”, but due to the fact that you can add as many or as few toppings as you would like in order to customize it to your individual hunger, well, that goes a long way towards “wasn’t that bad”. I have to say that this was quite an eye opening experience. I’ve never gotten convenience store nachos before because I figured they’d be complete garbage, and maybe I’d get botulism, but these turned out to be entirely passable for what they were. I don’t know if I need to do this again any time soon, but having done so I can give a knowledgeable nod and move on. Might not necessarily eat again, but that Slurpee, oh man, would definitely drink again in a heartbeat.